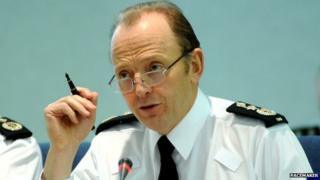 Northern Ireland politicians should look again at a 2009 report on how to deal with the past, former PSNI chief constable Sir Hugh Orde has suggested. Sir Hugh was speaking after the arrest and release of Sinn Féin leader Gerry Adams over the 1972 murder of west Belfast mother of 10 Jean McConville. The Eames/Bradley report contained 31 proposals for dealing with the legacy of Northern Ireland's Troubles. Sir Hugh said the fact it had been largely ignored was "a real tragedy". "I just wondered, why didn't somebody dust off Eames/Bradley and not withstanding one particular recommendation, that was a comprehensive, thoughtful and serious approach to dealing with the past and it has been largely ignored," he said. "That is a real tragedy." He added: "The past will not go away, people need to step up and deal with it. "As ever the poor old police service is stuck out on a limb doing its level best and there's an absence of political will to deal with the historical issues." Among the suggestions of the Consultative Group on the Past, co-chaired by former Church of Ireland Primate Lord Eames and former priest Denis Bradley, was a legacy commission headed by an international figure. However, the report failed to get political consensus and its conclusions were not acted upon. Last Wednesday night, Sinn Féin leader Mr Adams was arrested over the murder Mrs McConville. The widow was abducted in front of her children, shot and secretly buried. Mr Adams has described his arrest as a "sham" and said it sent entirely the wrong signal to people who were voting for the future. However, Sir Hugh said due process had to take its place. "The role of the police service is to apply the law fairly, impartially and proportionally and I expect that the process that's currently going on is now , of course, a matter for the director of public prosecutions in Northern Ireland to form a view on whether there is sufficient to charge. "So all the checks and balances in the rule of law process are now taking place." Meanwhile, Denis Bradley, one of the authors of the Eames/Bradley report, said he believed a political consensus that the past must be dealt with was growing. Mr Bradley - who is also a former deputy chair of the Policing Board - said policing had been damaged over the arrest and questioning of Mr Adams. "Policing was in danger last week of being deeply, deeply damaged because it is very difficult to police in a divided society where there is no consensus around policing. That was badly damaged last week," he said. "I think we have been through that, I think we have got over it and I think the institutions of policing are robust enough. But they cannot keep withstanding these kicks and this fracturing that we create for ourselves within this society." Meanwhile, Irish Deputy Prime Minister Eamon Gilmore has said he believes there is a window of opportunity in which progress could be made in negotiations among Northern Ireland's politicians. Speaking on RTÉ on Monday, Mr Gilmore said last year's talks chaired by Richard Haass had not failed. He said they could be concluded if the parties wanted to address the legacy of the past. The Haass talks broke down on New Year's Eve without a consensus being reached. They had examined the disputes on flags, parades and the legacy of the Troubles. Mr Gilmore said he was contacted Mr Haass to update him on the latest developments. He said he believed there was time between the elections in May and the marching season in July to make progress on some issues.